One carabiner can help you carry a water bottle, organize your keys or climb a mountain. But 1,856 carabiners? That’ll help you get a Guinness World Record. The certifier of superlatives says the record-setting chain was created on Feb. 25, 2018, in Pittsburgh. Charles spent two hours linking all the carabiners together. The finished chain extended 250 feet, 10.5 inches. If placed on a football field, Charles’ chain would extend from one goal line across midfield and almost to the 16-yard line on the other side. Not quite a touchdown, but definitely in the red zone. Guinness World Record attempts must occur in a public place. So Charles asked the manager of the Walmart in Carnegie, Pa., to use their parking lot. The manager agreed to allow Charles to section off a portion of the parking lot for the job. The completed chain stretched from the Walmart building, across the parking lot and to the Ford dealership on the other side. Getting the Guinness World Record required more than just carabiners and patience. Charles needed to work within the very specific Guinness guidelines. That meant witnesses, documentation and verification. He enlisted the help of some local teachers to serve as witnesses and to complete the official measurement. His parents took photos and video of it all. Charles Boone is an Eagle Scout from Dormont, Pa. For his Eagle project, Charles led the collection supplies for Animal Friends, a shelter in Pittsburgh. Charles and his volunteers collected more than 1,500 items — the largest single donation ever made to Animal Friends. He’s now a student at Embry–Riddle Aeronautical University in Florida. He has earned the Triple Crown of High Adventure and served on staff at the 2017 National Jamboree. 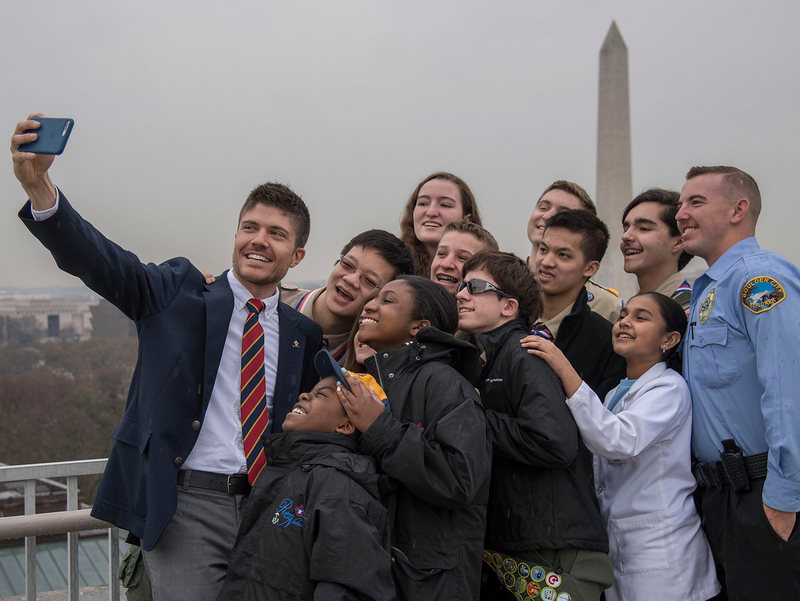 He’ll be on staff (officially called the International Service Team) at this summer’s World Scout Jamboree at the Summit Bechtel Reserve in West Virginia. What happened to all those carabiners? Charles gave most of the carabiners to his home BSA council, the Westmoreland-Fayette Council, based in Greensburg, Pa. That’s Charles above presenting the haul to council Scout Executive Martin Barbie. The council will distribute the world-record carabiners to Scouts this year at summer camp.